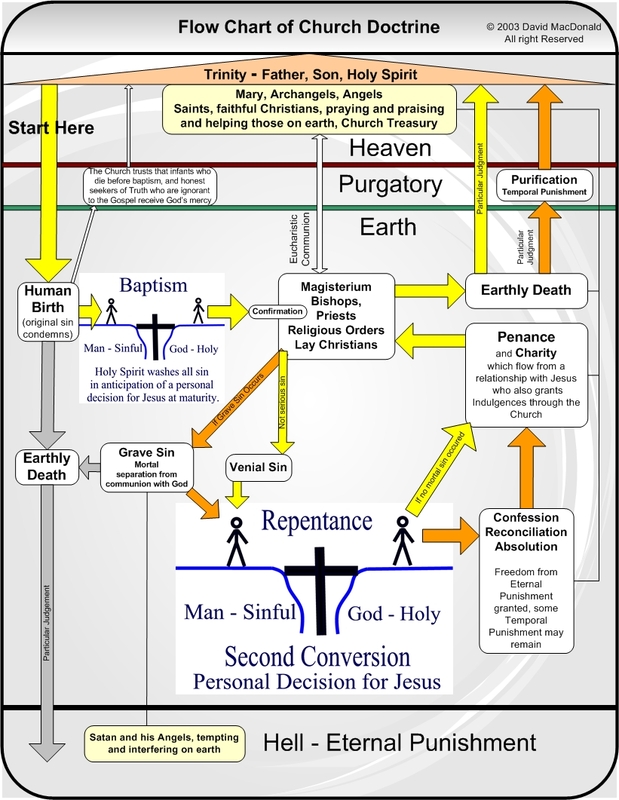 This flow chart shows how basic Church doctrines fit together. Forgive us, we know it looks like a new board game :-) Anyway, the major difference between Evangelical thought and Catholic Doctrine is that Catholics believe baptism is the critical moment of salvation. However, baptism brings with it an expectation that we will truly surrender our lives to Jesus as we mature. Theoretically, that point is at Confirmation, but for many Catholics, it comes much later, usually during a personal crisis where we really have a "conversion of heart" and surrender to Jesus (Catechism 1428,1430), similar to what an Evangelical would call being "Born Again". Catholics feel we "must endure to the end" (2 Tim 2:12) rather than the "once saved, always saved" theory. But Catholics believe God never forgets the indelible seal that is imparted at baptism and is always calling and waiting for us to turn to Him. I've used the classic "Evangelical Bridge Diagram" to emphasize similarities. This diagram may seem complicated but Catholics don't think God is afraid of complexity. (i.e., look at a dragonfly) This diagram is an image map. Simply move your mouse over the picture and click on any word or box to see an article about that subject. Purpose in life: Let Jesus' sanctifying Grace be the water in the cup: no water in cup; no salvation.